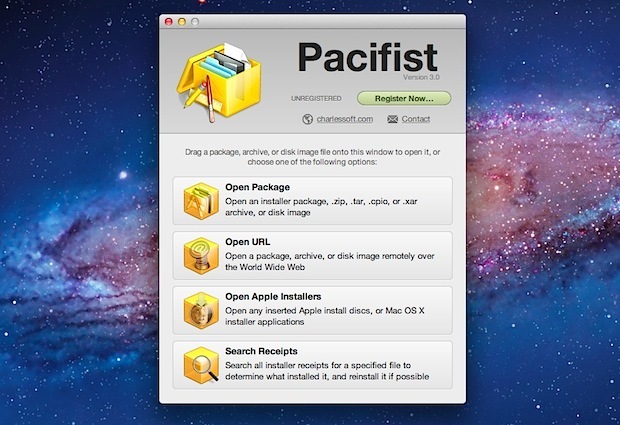 Pacifist is a powerful Mac OS X utility that gives you full access to package and installer files and their contents, without running the installer itself. Using Pacifist, you can open installers and disk images, find out what is in them, discover what is going to be installed and where, and best of all, extract individual apps, files, and folders directly out of them. Beyond package (.pkg) files, Pacifist will also read and extract from .dmg, .pkg, .zip, .tar, .tar.gz, .tar.bz2, .xar, and even Mac OS X Installer apps. There are plenty of troubleshooting and trick situations where this would be valuable. For example, if you have a installer file of OS X or a dmg you want to explore and extract files from, you can easily do that. Pacifist is free to download as shareware, and it’s well worth the $20 to add to an advanced Mac users toolkit. Pacifist is compatible with OS X Yosemite, OS X Mavericks, and just about all other versions of OS X, just be sure to download the version appropriate for your release. There’s also a Quick Look plugin that you can install, which is really handy if you use the tool to browse through package formats often. Actually browsing through package files and installers is very simple, all you need to do is drag and drop a compatible file into the Pacifist application (or the apps icon in your Dock), then browse through the contents as if it was part of a file system, extending through folders, viewing files, and, if you need to, extract data. For casual users, you may be want to remember that some of the features in Pacifist are bundled into OS X already, albeit on a more limited basis. 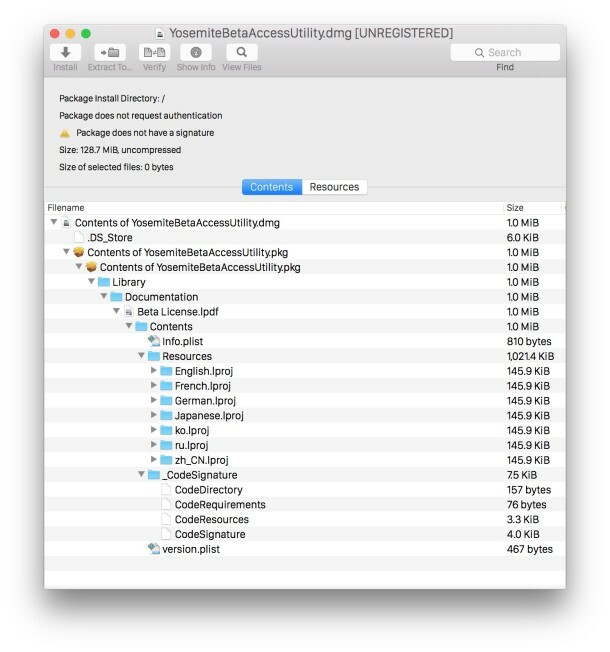 The OS X Installer has a little used ability to see what and where files will be installed, and the command line tool pkgutil lets you extract .pkg files contents, but neither is as full featured as Pacifist, and certainly not as user friendly or as flexible. We used this to run the old version of Preview in OS X Lion, despite not having Snow Leopard actually installed anywhere. If you have a Mac OS X Snow Leopard DVD laying around you could use Pacifist to extract the Preview.app and necessary files from the OS X 10.6 installer without running through the OS installation itself. That would have been impossible without Pacifist. I have been using Pacifist since about 2005, it is a wonderful utility for administrators. Can Pacifist insert kexts into dmg / pkg files?